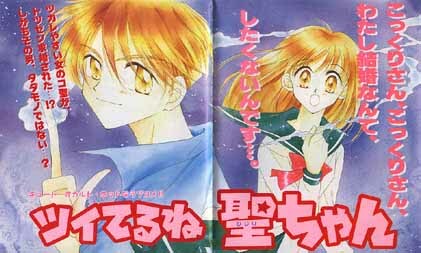 Tsuiteru ne, Hijiri-chan manga series by Andou Natsumi images and info. Part of a diverse shoujo anime, manga, video gaming, and live-action Japanese drama website. "Tsuiteru ne, Hijiri-chan" by Andou Natsumi (Smile de Ikou!, Maria-ppoi no!) describes itself as a "cute occult hot love comedy". It's the story of a not-so-regular girl that meets a mysterious boy named Gin who can turn into a fox and throw fire from his hand. Of course, he decides to stay at her house. A long time ago Hijiri made a promise to someone, and she often has a dream about it. But each time she wakes up before she can find out what the promise was. One day she wakes up to find a boy in her bed! When she calls her father in, the boy has disappeared. Her dad wonders if she's seeing ghosts again. 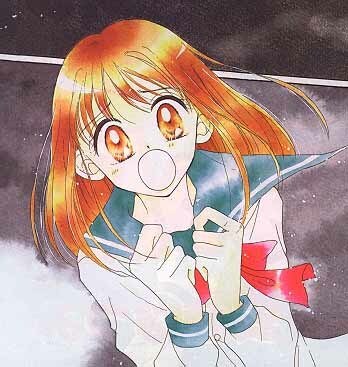 Ever since she was little, Hijiri has had the ability to see strange things, and she doesn't like it. She would love to be a normal girl, and does her best to pretend that she's just imagining the occurances. She doesn't want anyone to know about it, especially the guy she likes, Okumura Toono. Later that day her friend feels sick, but then suddenly switches to feeling fine, and Hijiri suddenly doesn't feel well. Next, she finds herself saying not-very-nice comments that she doesn't mean, hurting her teacher, friend, and even Toono! Just then the boy from her bed appears, telling her that she's been possessed by an evil being. The being tries to take Hijiri's soul, but the boy intervenes, asking Hijiri to take his hand. Hijiri remembers taking his hand from somewhere in the past, and immediately she recalls the dream: when she was younger she was attacked by an evil spirit and he came to her rescue. The boy can throw fire from his hand and he saved her.... on one condition. She needed to promise to be his bride, and he told her he would come back in 10 years. Hijiri is very surprised. The boy introduces himself as Gin of the Otora Kitsune, who has come to have her make good on her promise!